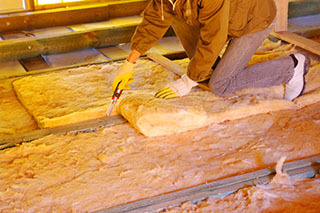 Loft insulation is a reasonably inexpensive and very effective way of insulating your home. An un-insulated home loses 25% of its heat through the roof, so you stand to make significant annual savings on your energy bills and reduce your home’s carbon dioxide emissions by up to 1 tonne. The heat in your home rises upwards and will eventually escape through the roof. By having sufficient insulation in the loft you can prevent this from happening. The heat will stay in your home, therefore keeping it warmer and using less energy. Insulation can last for 40 years, so taking care of it now is a real investment in your home. There are two main types of loft insulation – blanket type material on a roll or loose granular beads. The blanket insulation is typically made from fibreglass or mineral wool. The recommended thickness for this is 270mm. Most homes with insulation already fitted do not have anywhere near this depth of insulating material in place, so it’s worth checking and upgrading if necessary. Similar insulating material made from sheep’s wool, hemp or newspaper is available and whilst more environmentally friendly, be prepared to pay a lot more for it. The loose granular insulation is not ideal for draughty lofts although it may be easier to install around awkward piping or joist areas or in lofts with restricted access. It is possible to find more environmentally friendly options like newspaper or sheep’s wool but these are more expensive. The insulation is laid between and then over the joists on the floor. Walk boards can be laid on the joists to allow access to water tanks and pipes in the loft. If you fit insulation on the loft floor, less heat from the main part of the house will rise into the loft. This can mean a very cold loft space which isn’t ideal if you intend to store treasured possessions up there. You can combat this by insulating the roof with rafter insulation. However, you should only use rafter insulation as a top-up. You’ll also need 270mm insulation at the joists, otherwise you’ll be wasting energy heating a room that’s hardly ever used. If you do intend to use the loft as a living space there are Building Control regulations to be met so you’ll need to get professional advice. You will see different insulations categorised by ‘R’ value which is their thermal resistance. The higher the number, the more heat it will stop from escaping. This should be at least 6.1 in a loft but 7.0 is ideal. If you live in a house or a flat that has loft space then you should be able to install insulation. If roll insulation is being installed it is simply rolled out between the joists and then another layer is placed over the joists to ensure that it reaches the required 270mm depth. If you are having insulation that forms a floor to the loft the job involved in similar to laying traditional flooring. How much money can loft insulation save? A quarter of all the heat lost from your home escapes through the roof. Effective roof insulation will make it easier to heat your home for less money and can save you a significant amount on your heating bill. The Energy Saving Trust estimate that improving the roof insulation in an average home could result in annual savings of up to £240, depending on the type of home and the level of insulation in place already. The cost varies depending on the size of the property. The Energy Saving Trust estimates that insulating a semi-detached house with 0 to 270mm loft insulation has a typical installation cost of £300 but then could save you £140 a year. Can you ‘DIY’ your own? It is possible to insulate your loft yourself, but it’s not as simple as some might assume. For example, you need to select the right type of insulation, calculate the right depth needed and make sure that it is fitted around all the fiddly, hard to access bits like loft hatches. Plus, if you are not able to physically get into the loft you will need to use specialist equipment to ‘blow’ loose insulation into the loft. You may also need to insulate pipes and water tanks to prevent freezing. Professionals can advise you if your home needs treating for damp before the insulation takes place. A professional will guarantee that your insulation is fitted to meet regulations which will add value to your home if you sell it on. To be professionally recognised an installer needs to be a member of The National Insulation Association (NIA). They agree to follow a code of professional practice and commit to excellent customer service. 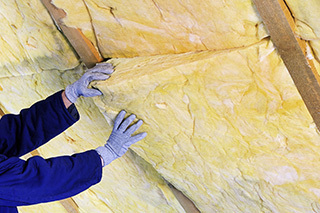 Grants and subsidies are available for both loft and cavity wall insulation from the Energy Company Obligation (ECO) in England. The government have committed to reducing our country’s carbon emissions in response to the issue of global warming. They have set the biggest energy companies targets i.e. they must help UK households to improve their insulation and install more efficient heating systems, thereby reducing energy wastage. Under this scheme, you could be eligible to apply for a grant towards improving or replacing your insulation. This includes loft insulation, cavity wall insulation, room in roof and both internal and external wall insulation. You need to be in receipt of benefits to qualify for a grant, but if you do it can cover some or even all of the cost of your new insulation.